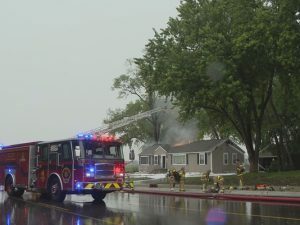 Several residents were without power after a severe storm on Sunday, June 11 and Xcel Energy worked to restore power. 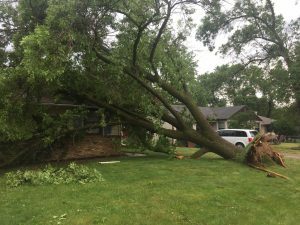 A few trees were uprooted causing damage to homes. As of Monday afternoon, all traffic signals are operational and there was one branch in the road at 36th and Lee with wires in it. Thanks to Xcel and Crystal public works crew who are out cleaning up (catch basins, parks, streets, etc), along with neighbors. Need to dispose of yard material from the storm? The Maple Grove Yardwaste Site is open seven days a week to accept leaves, branches and other tree debris. Get details here. 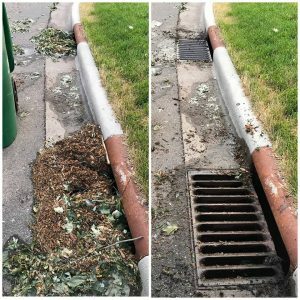 You can help prevent local flooding and protect our streams, ponds and lakes by cleaning up a storm drain near your home. West Metro Water Alliance & Hennepin County have a list of tips by “adopting” a storm drain. Please help by cleaning a drain near you if you see it covered with debris. Thanks! Crystal is full of compassionate neighbors who quickly jump into action to help each other in person and online. If you’re not on NextDoor.com, please sign up to connect in your neighborhood. Thank you for all you do to keep our city a great place to live! Together, we weather through any storm.